If I told you how I made these crackers, I think some of you might think it was a small stroke of genius, and others of you might think it was unsanitary and gross. But when I went searching in my drawers for a small heart-shaped cookie cutter yesterday, I came up empty. 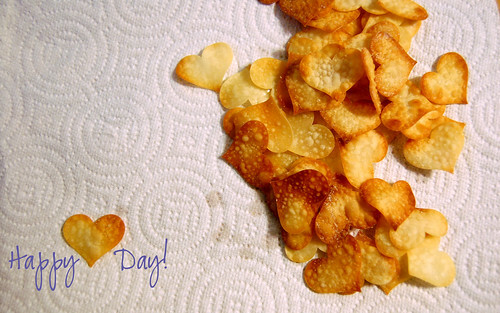 And you know, that heart-shaped paper punch wasn't the cheapest thing in the world….and those sheets of wonton wraps fit so nicely into the paper punch, and slide out so easily…..and then perfectly-formed, crispy, crunchy salty little heart-shaped crackers are born and I'll never look at another paper punch the same way again. If you're interested in the details, aside from the paper-punch part, the crackers can be made from wonton or egg roll wraps (in your produce section). Brush both sides with olive oil, salt them (or cinnamon, whatever floats your boat.) Bake them on a cookie sheet, lined with parchment paper, 350 degrees for a few minutes until golden brown. But watch closely they go from brown to burned while your back is turned. Hey, that rhymes! Alright, alright. Enough. Here are the winners for last week's fun round of giveaways. Thank you all for stopping by, playing along. Come visit again and even say hello, will you? There will be more giveaways, too…so stay in touch. Milkshake CD and DVD: Melissa H.
We SERIOUSLY need some new music around here. I'd love to win this one, thanks! I thought I posted, but didn't see the secret code thingy. I'd love to be entered in your drawing…dd would love this. How sweet is that book! Awesome. Sounds great! Pick me please. I've never even heard of one before. Winners: Send me an email (find it on the About page) with your contact information and I'll get the details worked out! The paper punch idea is ingenious! Yum! Cute crackers! Those paper punches are handy. That is very inventive. I would have never thought of using a paper punch. Will have to remember that one. Hey, those crackers sound like fun. We have some extra won ton wrappers sitting in the freezer anyway. Hmm… I’m thinking practice with the pizza cutter would be a fun activity for my litte one. I’ve used scrapbook scissors on cookies before. Peopl who make bento lunches often use punches for seaweed decorations, so don’t feel gross. hey molly, what kind of shelf life do they have? i am thinking of making some tonight but am not sure how many-if they get stale in 24 hours, i’ll only do a few. the comments are closed on the milkshake post, so i’m leaving it here instead. how did i miss that? you guys will have to come here next time i see that they’re playing somewhere nearby. l. loves them too – superhero is her favorite. lisa’s kids went to the preschool my kids went to – so i feel like i can say i knew them when. sort of. I loved this cracker idea so much I made some myself. Thanks for such a wonderful recipe!